Fans of the highly anticipated follow-up to the 2013 monster hit Pacific Rim will be thrilled to explore the epic art of Pacific Rim Uprising. 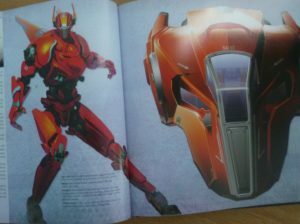 The Art and Making of Pacific Rim Uprising takes readers behind the scenes and back into the heart of the epic battle between Kaiju and Jaegers. Showcasing the brilliant concept art behind the film and immersing fans in the creation of a true sci-fi epic, this book will be the ultimate exploration of one of the most anticipated films of 2018. Directed by Steven S. DeKnight, (Angel, Smallville, Daredevil), Pacific Rim Uprising stars John Boyega (Star Wars: The Force Awakens), Scott Eastwood (The Fate of the Furious), and newcomer Cailee Spaeny. For your chance to win a gorgeous hardback book we’re giving away courtesy of Titan Books enter via our competition app below! The competition ends at 23:59 on 10 June 2018. The prize consists of a The Art and Making of Pacific Rim Uprising book.